Audio from the session: Healthcare, housing and schools - fighting for survival, fighting for more. We still have a long way to go. 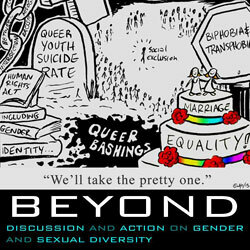 Health, housing, school and other institutions marginalise gender/sexual minorities, among other oppressed groups. A discussion of how to transform these institutions to meet all of our needs.